Innovations found on the Porsche 911 that made their way to the new 1965 912 included self-supporting bodywork with front independent suspension on transverse links and damper struts with longitudinal torsion bars, and rear independent suspension on lateral links and transverse torsion bars, and a jointed ”Safety Steering" mechanism with three short column links designed to collapse in the event of front end crash. Other styling cues included glass covered headlights, sealed turn signal units, 4 1/2" x 15" steel wheels with hubcaps, four-wheel disc brakes, Nadella half-shaft axles, 356-style aluminum bumper and rocker trim, a small round Durant side mirror, silver wiper arms, operable vent windows, and green-on-black faced three gauge instrument cluster. For power, Porsche utilized a slightly detuned version of the Type 616/36, air-cooled, 4-cylinder, boxer, pushrod,engine from its bowing 356SC, which had a displacement of 1582cc, a compression ratio of 9.3:1, and produced 90 horse power at 5,800rpm. Upon adapting the new 911 into the 912, more than just the motor was carried over from the 356. Most dramatically, as with the 356, the interior dashboards of the first 912s were painted the same color as the exterior of car, thus creating what is now referred to as a “painted dash” 912. (In actuality, the dashboards of all early 9-series Porsches were painted the same color as the exterior, but as a cost cutting measure, the first 912s were then not given the additional layer of anti-glare matte black paint and strip of teak wood trim that came standard on the 911.) Other 356 touches that could be found on early 912s included a fluted shift knob, a small 356-style fuel door pull, and 356-style seats with perforated backs. Other more subtle features unique to the earliest 9-series Porsches include a VIN plate mounted along the edge of the gas tank vs. by the front trunk latch assembly, non-adjustable front shock placement, a side mounted windshield fluid reservoir, and window frames that tapered outward where they meet the doors. In the engine bay, there were large “dueling elephant” style Knetsch canister air filters, (whose primary design purpose may have been to fill the empty space in an engine bay originally intended to house a much larger power plant). Popular options for 1965 model year 912s included a wood steering wheel, tinted glass, Hella 128 fog lights, a gas powered heater, 2-point and 3-point seat belts, adjustable head rests, talbot mirrors, and chrome plated Leisritz wheels. Various Blaupunkt and Becker radios were offered as well, with U.S. models going up to 108 on the FM band vs. European models that only went to 104. Another option available for 912s of all model years, including 1965, was a sunroof, however very few 912s came equipped as such. 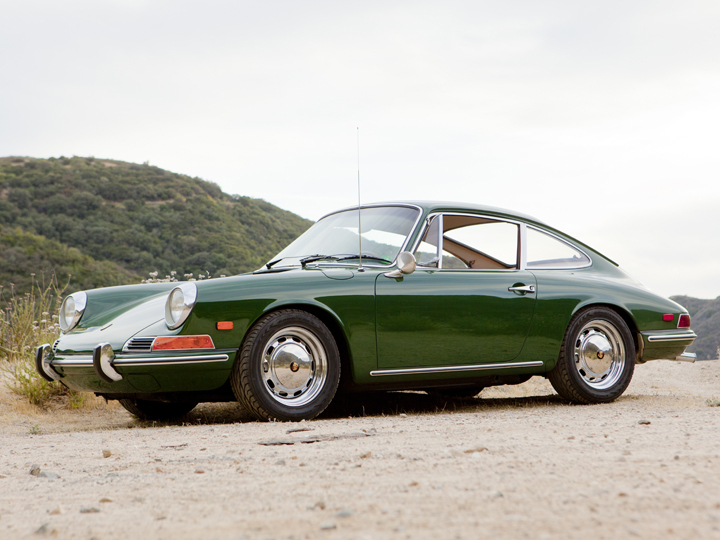 Reportedly, when new the cost of a sunroof 912 was actually within range of a 911. It has been speculated that only the Porsche factory could equip a 9-series body with a sunroof, whereas Porsche’s preference was to utilize subcontracted car bodies built by Karmann for 912 production, hence any sunroof 912 meant one less body would be available for a more profitable 911, thus to offset this loss Porsche charged for sunroof 912s accordingly. 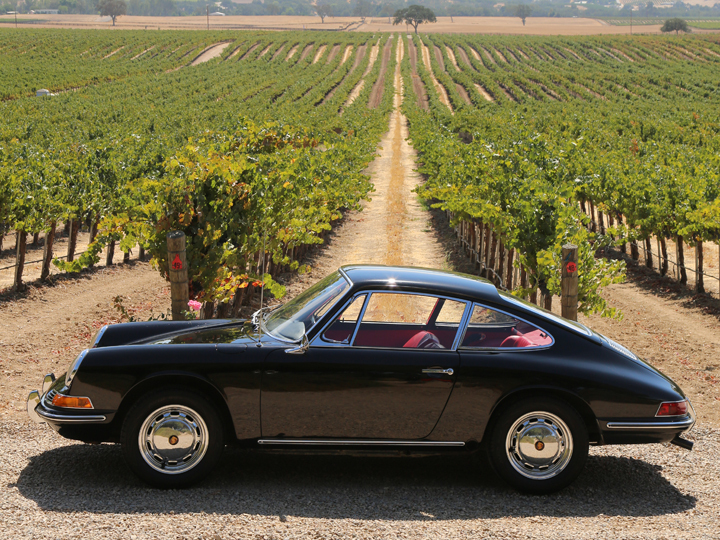 Confusingly, there is no cutoff date, serial number nor feature that definitively denotes a cutoff between the 1965 and 1966 Porsche 912 model years. Towards the end of the 1965 model-year run going into 1966, the most obvious change Porsche made to the 912 was to paint all dashboards matte black as had always been done on the 911, but instead of 911’s teak wood dashboard strip, the 912 received a decorative a band of brushed aluminum. Other 356 vestiges that disappeared in 1966 included the fluted shift knob, which for 1966 was shaped like a round ball, and the gas tank door release pull, which for 1966 was identical to the trunk and rear deck lid release pulls. Sun visors, which had been entirely white in 1965, were now black on one side and white on the other. In the engine bay, air filters were changed to a more sensible and practical design. Midway through 1966, both the trunk VIN plate and the windshield fluid reservoir were moved towards the front of the car, and chrome plated brass 4-screw horn grills were replaced with a chrome plated pot metal 2-screw type. Options for 1966 were the same as they were for 1965, however the wood steering wheel offered in 1966 featured a steal hub and spokes, whereas the year previous they were made of aluminum. In 1967 the “912” badging on the deck lid and glove box that had been rendered on 1965 and 1966 cars in an angled cursive script, changed to a linear block style font. Also, instead of an interconnected “PORSCHE” badge on the edge of the deck lid, 1967 cars received individual “P-O-R-S-C-H-E” letters that ran underneath the vent on the deck lid. Bumper guards, which had been chrome through 1966, now incorporated a rubber strip for added buffering during over zealous parking. Inside the car, a 5 gauge dashboard became standard in 1967, with the additional gauges being a clock and an ambient temperature gauge. Sunvisors, which had been black on one side and white on the other in 1966, were now entirely black in 1967. The round shift knob now featured a shift pattern. Perlon carpets replaced the 356-style square weave, and a carpeted tunnel cover replaced what had been rubber. The handles on ash trays and glove compartment were also revised. In the engine bay, the engine support now featured 4 bolts in a straight line vs. 4 bolts in a rectangular pattern. Nadella half shaft axles were replaced with Lobro constant velocity joints. Most dramatically, 1967 saw the introduction of the Targa body style, which was Porsche’s answer to a 9-series convertible. Because Porsche lacked the resources to develop a dedicated open air 9-series variant, they employed a stainless steel roll bar to provide the structural rigidity inherent in the coupe design, with a removable and stow-able roof section. In addition, the plastic rear window could also be zipped out, thus allowing for 4 different roof combinations. On rare sunroof optioned cars, drainage vents were moved from just above the upper corners of the rear window, to the internal drainage channel of the rear decklid. The most significant option to appear in 1967, were Porsche’s now iconic Fuchs forged alloy wheel. Flower power indeed! In 1968 the United States Department of Transportation (D.O.T.) 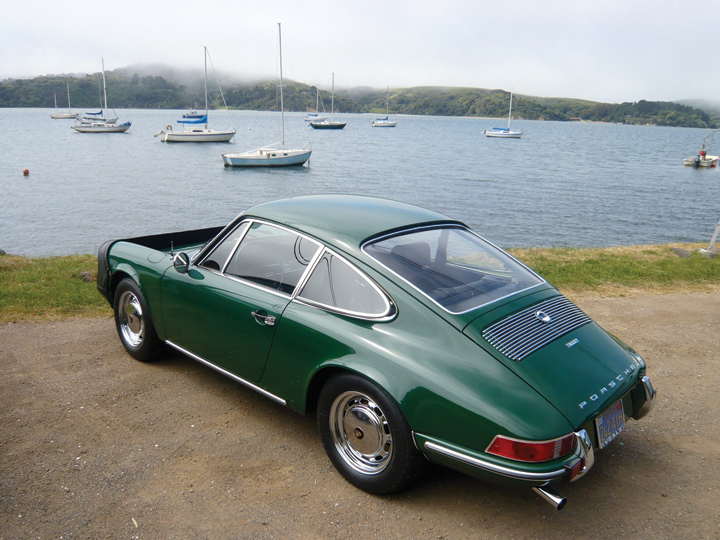 imposed mandates that would significantly change the Porsche 912 for that year. No longer permitted were glass lenses that had enclosed the headlights, and in their place were large chrome bezels that housed the lenses directly. Windshields were now made of composite glass for increased strength. Instead of silver, windshield wipers were painted matte black to reduce unwanted reflections. And to increase wanted reflections, Durant side mirrors were enlarged considerably. Door buttons were more recessed. For U.S. cars, colored reflectors were also fitted to the sides of the car. Inside the car, the 1968-only the rear-view mirror was attached to a spring-loaded release attachment located on metal window frame, between the sun visors instead of the chrome plated metal type bolted to the roof of the car. Easier to read white lettering replaced the green Porsche had historically used on all its gauges. All interior fittings, from window cranks to ash tray pull, were now encased in soft rubber plastic, which was deemed to be less damaging to occupants in the unfortunate instance of a collision. In addition to safety concerns, the U.S. D.O.T. also imposed environmental regulations for 1968, which Porsche was able to comply with by introducing a vacuum advance 050 Bosch distributor, split-shaft Solex carburetors, and an air pump that pushed more air through the tail pipe thus lowering emissions but only as assessed expressed in terms of parts per million, and not over all. For 1968, 912 door panels were a unique 1-year only design, and door frames in were now aluminum in stead of chrome plated brass. For added stability, wheel width was increased from 4.5” to 5’. For more reliable braking, a dual circuit master cylinder was introduced. A larger 420 watt generator charged the battery faster. As of January 1968, the soft-window Targa becomes designated as 'Version I' only available with a rear shelf and compartments, rather than the occasional +2 rear seats. Also sold as an extra-cost option was the hard-window Targa 'Version II' which featured a fixed glass rear window and rear seats. Like the 356, and its A, B, and C variations, the factory drew distinctions in the 911 / 912 series, but unlike the 356 series, this time the factory used such designations internally. Based on experience with the 911 / 912, including racing, the factory made enough changes to warrant an internal 911 / 912-B designation for the 1969 model year. This is also known as the long wheel base (LWB) revision. To improve handling without penalizing ride, the rear wheels of the LWB version were moved back by 2.5 inches, with no change in overall vehicle length. Another distinctive body change for 1969, was the addition of wider wheel flares added to the side of the body, which could accommodate wheels as wide as 6 inches. On the interior, 1969 model year 912s received a revised dashboard with a new heating and ventilation system with three-setting fan, revised arm rests with integrated door pockets, and power windows were added as an available option. 1969 also saw the addition of a flashing warning light system, an illuminated glove compartment and a smaller steering wheel with upholstered horn button. The rear windows on coupes were electrically heated, thus eliminating air ducts, and vent windows were now fixed in place. Seats were now designed for optional adjustable headrest mounting directly into seat backs. Other changes for 1969 included revised turn lights with illuminated side markers and removable lenses. The battery location was moved under the headlight bucket. Safety benefited from larger brakes front and rear. Vent slots appeared on the stainless steel Targa bars. Popular options for 1969 included Fuchs 6" x 15" alloy "windmill" wheels and Hella 169 fog lights. The Porsche factory advertisement "Fact Book" states a slight increase to 103 horsepower (SAE).